It is the Royal palace of Ubud originally. However, recently, Balinese Dance is performed in Puri Saren every night. Therefore, the place became famous as the sightseeing place, and tourists can see the front part of the room. The royal family descendant still lives in the palace, so tourists cannot enter to the internal building. People respect the king and cooperate for preparing festivals, etc. Ubud Tour Started from the Palace! Ubud is very popular tourist destination in Bali and known as a culture village. 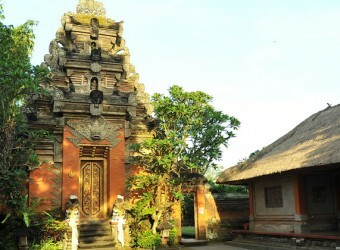 Ubud has many tourist attractions including nature, dance, art, historical remains and temples. I went sightseeing in Ubud a day. Sightseeing tour started from Ubud palace! !It was very dignified.